Rhubarb pie exists, one could say, simply to take us back to memories of grandmas and simpler times. Its old-fashioned taste is overwhelmingly lovely whether you use fresh or frozen rhubarb. 3. 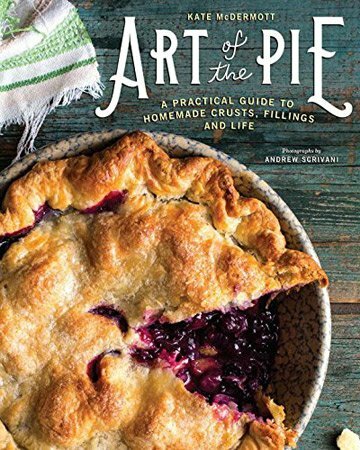 Roll out the one portion of pie dough and place it in a 9-inch (23-cm) deep dish pie pan. 4. Heap the filling over the dough in the pie pan. Break up the butter into little pieces with your fingers and dot it on top of the filling. 5. Roll out the remaining dough, place it over the fruit, and cut 5 to 6 vents on top, or cut strips and make a lattice top. Trim excess dough from the edges and crimp. 6. Lightly brush some of the egg white mixed with water over the entire pie, including the edges of the dough. 7. Bake for 15 minutes. Reduce the heat to 350°F (180°C) and bake for about 30 minutes more. Then open the oven and quickly sprinkle the top of the pie with sugar. Close the oven and continue baking for another 10 to 15 minutes, or until you see steady bubbling in the filling coming through the vents or lattice. 8. Remove the pie from the oven and let cool completely before serving. The longer the pie cools, the less runny it will be. Pie of any sort is always a big hit at our house but rhubarb pie is a favorite of mine. I used a bag of frozen rhubarb from my garden. It had been cut into 2- to 3-cm pieces when frozen and measured almost 8 cups. Mixing the sugar, flour, etc., with the frozen fruit only took 2 or 3 minutes. The sugar pulled a lot of liquid from the frozen fruit. I had to drain about 90% of it off or risk a major oven disaster. The drained fruit made a nice big mound in the bottom crust. I then continued assembling the pie. Baking times were accurate. I allowed the pie to cool for 2 hours before serving with a sweetened whipped cream. It was moist but not runny and had set. The fruit had retained it's shape. I can't wait to make this one again with fresh rhubarb from the garden. Next time I would add half the sugar to the fruit to draw out the juice, drain and add the rest of the ingredients and the rest of the sugar just before assembling the pie to bake. I would save the drained juice in case the fruit was too dry or for another purpose. I'd also increase the amount of the nutmeg as it was lost in the final pie. Grated ginger might also make a nice addition in future. I love a fruit pie and I love rhubarb, so I couldn't pass up this simple old-fashioned rhubarb pie recipe! With frozen fruit available year-round, it’s easy to enjoy a tasty rhubarb pie like this even when certain fruits aren’t available in their fresh form. This truly was a pie that had a perfect crumbly crust, a perfect jammy fruit filling, and a perfect level of sweetness...and was beautiful in appearance. 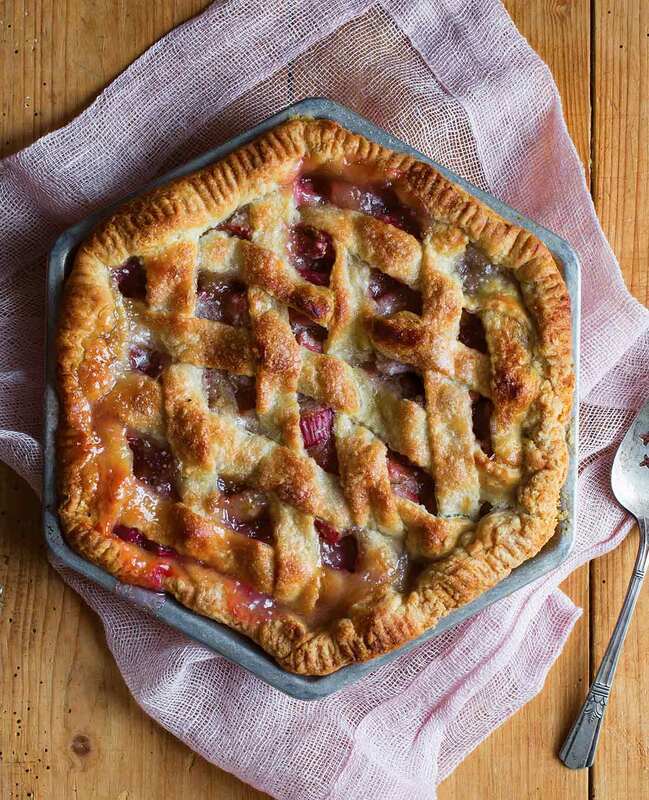 In fact, I think you could use this recipe as a base fruit pie recipe for just about any fruit you’re interested in cooking with, not just rhubarb. That said, I made this 9-inch deep-dish pie with 7 cups frozen, cut rhubarb. I used my favorite store-bought double pie crust for the pie which made assembling everything a breeze. I don't think I've ever made a pie that you start out cooking at such a high temperature, then finish it off at a reduced heat. I was worried at first that baking the pie this way and never covering it with foil would make the crust overdone and too dark, but it was perfectly browned yet still tender. I think this had to do with the high temp at first and then the longer cooking time at the lower temp. I allowed my pie to cool for an hour before serving with a scoop of creamy vanilla ice cream. I can also see a dollop of vanilla creme fraiche working wonders as well. This pie should serve 6 to 8 people, depending on how generous your slices are! I didn’t have issues with runniness after letting the pie cool; I think the filling's consistency was just jammy enough. Can't say enough good things about this pie! Yum, yum. Rhubarb Pie Recipe © 2016 Kate McDermott. Photo © 2016 Andrew Scrivani. All rights reserved. All recipes and photos used with permission of the publisher. I love that you didn’t spoil the wonderful rhubarb experience with sweet strawberries ~ this is the classic! I couldn’t agree with you more, Sue! I’m a purist. Glad to hear you are, too.